I have heard several people discuss getting a new pet recently. I own 3 ferrets and whenever that topic comes up I hear people say “I want to own a ferret one day.” Ferrets are a great animal to own, as long as you can provide everything you need for them. Ferrets can get a little tricky. They can be messy, stinky, curious, expensive, and sometimes even mean. I have found that the female ferrets seem to be a little more vicious than the males, but by all means do not have these animals around children, even if it seems like the sweetest animal you have ever met. They do have teeth and claws. The children and the animals do not know better. There have been several incidents where parents have had their infants around ferrets and it never, NEVER ends well for the child. Ferrets will cost you a decent amount of money. You’re going to need to pay for a decently sized cage, preferably multiple litter boxes, litter, ferret food, treats, toys, water dishes, and bedding. Ferrets also require vet visits. It is necessary to get them their rabies and distemper shot, after the first year they will need at least one visit a year. Also, keep in mind, ferrets can catch sickness such as the flu when you are sick, so be careful when holding them when you don’t feel your best. A ferret’s diet is very simple. They are carnivores, so their diet consists of meat. High in protein, high in energy and low in fiber. Marshall’s Ferrets is a large company that Petco gets their ferrets and other products through. It is a ferret mill that hasn’t had the best reviews on how they treat their ferrets when they are in their fosilities, and also in the products that they sell. Many people purchase a ferret and think ferret food would be the best option for them. I know that’s what I thought, but this is why you should do a lot of research before purchasing an animal. Cats and ferrets have similar nutritional needs. Most high quality kitten foods are better for ferrets than some common ferret foods. A great substitute would be WELLNESS core kitten food. Why wouldn’t you want to feed your ferrets Marshall ferret food? Well, like I said, ferrets are CARNIVORES, strict carnivores and Marshall’s food has a lot of harmful ingredients for these picky creatures. One ingredients in this product is corn, do NOT feed your ferrets vegtebles or fruits. A ferret can live off of Marshall’s ferret food but will not have the longest or healthiest life span (they should live about eight years), they will also be more prone to illnesses. 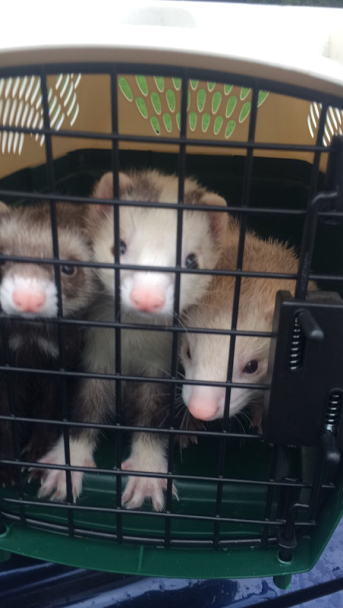 Buy ferrets in bunches, and learn about the place you’re purchasing them from. Many people purchase ferrets from Petco and do not know that those ferrets come from a ferret mill, and that could also be a result in aggression or health issues. Ferrets consist of a lot, a lot, a lot of attention and I cannot stress this enough. Do not purchase a ferret without a large time span of researching and thinking about this purchase. A ferret will sleep when they are not being held/played with, just because they are sleeping doesn’t mean you shouldn’t wake them up and play with them. Wake them up! Play with them! At ANY time, they love it. Not having a cage for your ferret and letting them out all day to play is the most ideal thing to do for them, but it is not always the safest, such as in cases where houses may have holes that lead to basements or outside, places that have a lot of cords out, or multiple things you do not want your ferret to get into. Having your ferret out of the cage for four hours a day is the minimum you should be playing with them (especially without a second ferret). I do not recommend having a ferret if you do not purchase two. They love cuddling, wrestling, and playing with each other. There will be days where you do not have much time to spend with your ferret and those are the days you’re going to be glad you purchased a second because you don’t want a depressed animal, and if you’re okay with your animal not being at its happiest then you should not own one. Some people even say you should purchase three in case one dies and the one left can become HIGHLY depressed in that case. Although, do not purchase too many because vet bills can become intense and when you are not providing them with good health you might as well not have bought one in the first place. Please, do not go out and purchase a ferret just because you think they’re cute one day – if that’s the case, then you’ll probably be trying to return them in the next two weeks or so. Just keep in mind that I only went over a few basic key points to purchasing and owning a ferret. Going to Petco to learn all of your information isn’t always the best idea, so use your computer and do your own research. I’ve owned my ferrets for over a year and a half and I’m still learning. These are amazing animals to own, and you will have a lot of fun with them, without a dull moment, but make sure you remember that this is a long term commitment as they can live eight years if taken care of properly. « Is MOA more concerned about money or people? Ferret are awesome I have two ferrets and I am very happy with them. Also have a dog but ferrets are for me much better pet.